Girls. Girls work together. They play together. They get their nails done together. They share a glass of wine together. They say terrible things about work colleagues together. And then they go to dinner together. One of my work colleagues – a dear friend – recently recieved the annual staff award at our office and to celebrate we treated her to an evening out at Brasserie Max, the chic & snug restaurant on the ground floor of the Covent Garden Hotel on Monmouth Street. The atmosphere of the hotel is everything I love about Covent Garden. 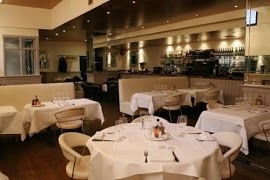 In fact, I love all the Firmdale Hotel chain restaurants. They have comfy chairs, grand zinc bars, perfectly cooked yumlicious food (yes, I said yumlicious) and they can happily accommodate any dietary requirement. If you are a lover of cocktails, they all look amazing – and if the never ending stream of waiters carrying trays of martini glasses is anything to go by, they taste delicious as well. We all ordered from the set menu. (The set menu we had to ask for because it wasn’t offered to us when we sat down.) Two of us ordered the salmon and two the shepherd’s pie. The food arrived and the salmons were superb. The shepherd’s pies, however, were tepid. Both of them. So they were both sent back to be heated through. I’m a slow eater at the best of times. I ate especially slowly on this occasion. But bar the last bite of salmon and a stem of broccoli I left on the plate (to seem slightly less rude and like I’d eaten my entire meal while two of the other diners sat waiting for their meals to return for over TWENTY MINUTES), the other salmon diner and I had both eaten our meals when the two hot shepherd’s pies arrived back at the table. I will give Brasserie Max this – they could have heated the pies through in a microwave, but they did not. They in fact prepared two new shepherd’s pies from scratch. A testimony purely to the integrity of the back of house – that’s not lost on me. However, we did not get to eat our meal together and that felt uncomfortable and quite frankly it was the front of house’s problem to sort out. But hey, the company was good and it was a celebratory evening, so I tried not to behave as incredibly annoyed as I felt. I assured myself Brasserie Max would do what decent fine dining restaurants do and would comp us some desserts or knock a percentage off the bill. But the bill came and no discounts were given and no comps offered. We were treating our friend and there was no way I was kicking up a fuss at the table, given the circumstances. I guess what Brasserie Max doesn’t know about me is that I have worked back of house in fine dining restauranst – far finer than Brasserie Max. And when a restaurant does something this appalling and doesn’t try to make it up to you – no matter how friendly the staff and no matter how good the food, they are basically telling you that you don’t really matter as a customer. I don’t mean in some deep and subconscious way – this basic hotel/restaurant management 101 stuff. And to top it all off, because the message just wasn’t quite clear enough, they had the sheer cojones at the end of it all to tell us that they needed the table back (“Oh, do you mean the table that we’ve had for this long because we ate our main courses in two separate sittings?” I’ll point out there were other tables free at this point and no one queuing to get into the restaurant at 9pm on this fairly quiet weekday evening). I do a lot of professional restaurant reviewing these days and don’t often have the opportunity to write reviews on my own blog anymore. I was looking forward to writing up a really glowing review of this evening’s experience, but sadly, Brasserie Max, I have got your message loud and clear. This entry was posted in British, European, Musings, Reviews, Travel and tagged brasserie max, covent garden, covent garden hotel, disappointing, firmdale, firmdale hotel, firmdale hotels, food, london, monmouth street, restaurant, restaurant reviews on April 16, 2014 by Our Little Organic Life. The world is full of them. I’ve eaten at disappointing restaurants in Paris, Monaco, Lisbon, Prague, Toronto, New York, Boston, Mexico City, Miami and a myriad of other obscure towns and cities across the globe. I am sorry to say that London is no exception and I have experienced rather a lot of disappointing meals here in the Big Smoke. In some places, the food was mediocre; in some, the food was awful. In others yet, the food was great but the service was awful. Despite the variations, they all can be described as disappointing. I feel an almost civic sense of duty to record these episodes, not only as a warning to my fellow gastronomes and gastronomists, but as also as a way of saying to these chefs & front of house managers: Its just not good enough. So, on the week we say a sad farewell to my favourite chef of all time, the late, great Charlie Trotter, and on a happier note, we also see Jamie Oliver accept his Honorary Fellowship from the RCGP for his work on childhood nutrition, I turn my eyes, stomach & pen to another celebrity chef: Marco Pierre White. When we arrived in this basement eatery, I was a little underwhelmed by the interior. I mean, it was ok. It just looked a bit like a tired, worn out, MDF, stripmall chain version of a decent restaurant. I can sum up the rest of the visit in a single paragraph. The food was fine. The kitchen was slow. The service was slow. The orders were wrong – twice. The front of house were obviously not happy (or they made a jolly good effort to make themselves look pretty miserable) and the restaurant was severely understaffed – at many points there was not a single waiter to be found on the dining room floor. Now – this bit is cruel – but being so close to Liverpool Street Station, the atmosphere reeked of train station pub – a bit Wetherspoons-esque. Also, the clientele were, well, mostly a bit of an odd mix. There were a lot of Essex couples (and by that I don’t mean people from Essex, I mean TOWIE wannabees), a few City secretaries on a night out, some oddly mismatched Internet first dates and a couple of wierd American tourists. Three hours after entering the restaurant, we emerged, feeling both slightly poorer and in a vague state of shock. This entry was posted in British, European, Musings, Reviews, Travel and tagged charlie trotter, city of london, disappointing restaurant, food, jamie oliver, liverpool street, liverpool street station, london, marco pierre white, marco pierre white steak & alehouse, mpw, mpw steak & alehouse, restaurant, restaurants, steak, steak & ale, steak & alehouse on November 6, 2013 by Our Little Organic Life. Dear readers… I wrote this post nearly two weeks ago, but my laptop died somewhere along the way. 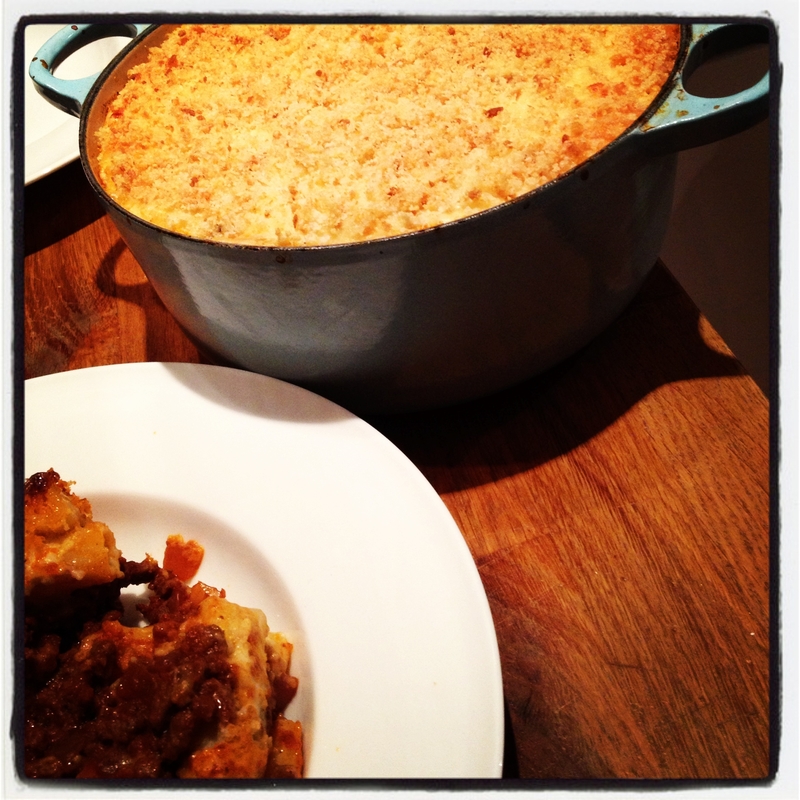 I hope you enjoy the memories of the London snow & the recipe for pastitsio (regular, vegetarian & gluten-free versions)…. London has been blanketed in a rare covering of snow these last few days and from what I can see, its only us owners of large dogs who dare to don our arctic gear and bravely head out into the 2 inches of snow. It gives me a chance to show off my new down coat from UniQlo – a Christmas present from my mother. Despite the fact that I am constantly cold in the general London state of damp, I feel oddly warm when out in the snow; so after this morning’s excursion through Peckham Rye Park, Gwenny (the dog) and I elected to spend some time in the front garden brushing clear the walkway of snow, just enjoying the quiet as the snow continued to fall. Cold weather requires some serious carbs and in anticipation of today’s serious snowfall, I spent yesterday morning dragging Mr Harris through Waitrose to get the ingredients for a pastitsio – something I had never made before. Having spent the last 25 years as a pescatarian, I also had no idea how it was meant to taste either. I normally turn to Vefa’s Kitchen whenever I decide to try a new Greek recipe, but on this occasion I decided to try Rick Stein’s version. First of all, let me say that to anyone who describes this pastitsio as a ‘Greek lasagne’ – you are doing pastitsio a severe injustice. 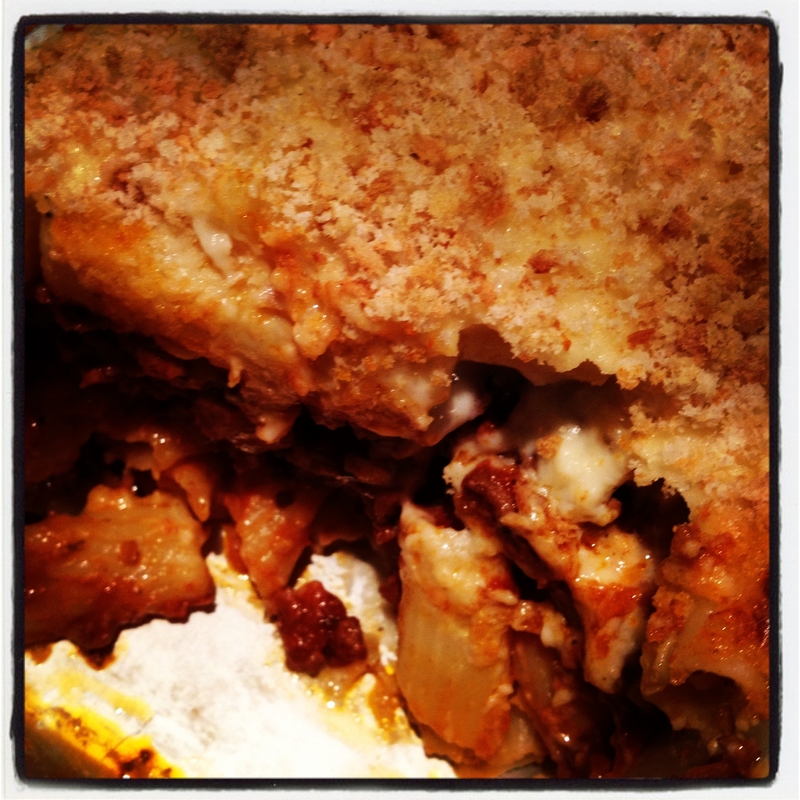 Its actually nothing like a Greek lasagne, except that both involve ragu and pasta in a sort of layering system. Ok, so I can see why you would describe it as a Greek lasagne, but I can’t tell you how much infinitely better pastitsio is. Sorry to any Italian readers, but its true. I went to great pains to make two versions – mine was made with gluten-free corn penne and Quorn mince. Mr Harris’ version was made with tortiglioni and mince from some of Prince Charles’ horribly expensive aberdeen angus cows. I knew that all the extra work & additional expense in making two versions was totally worth it when my husband tried a mouthful of each and announced “yeah…actually, you can’t really tell the difference”. I suspect the reason for that is because of the incredibly pungent and yet extremely counterintuitive combination of Greek flavours: oregano, cinnamon & tomato. It gives that…what’s the Greek for ‘je ne sais quois’? (According to my Babylon translator that’s Δεν ξέρω τι.) Ok, so it gives that Δεν ξέρω τι to a lot of Greek dishes. It feels wrong, but as soon as the oregano liberates its fragrant oil and the cinnamon sticks start to soften and unfurl and release their flavours slowly into the sauce, the smell is distinct and the flavour does not disappoint. It tastes exactly as its meant to and all the oregano in the world alone cannot achieve it without the accompanying cinnamon. A few pointers along the way. I will say that when making the white sauce, this is not the time for skimmed milk. I used a combination of whole milk and 2% milk. It needs to be rich, creamy, calorific and very nutmeggy. Also, tomato paste. It comes in metal tubes and they last for ages when kept in the fridge. Why buy a jar which will be half used and covered in a field of fuzzy mould next week? Unless you actually cook with it everyday, just stock up on tubes of proper Italian or Greek tomato paste and keep them in the fridge after they’ve been opened. I have included my notes on how to make vegetarian & gluten free adaptations of the recipe at the bottom. 2. Add the red wine, tomatoes, tomato paste, cinnamon stick, ground cloves, dried and fresh oregano, bay leaves, 100ml water, 1½ teaspoons salt and some black pepper. Simmer for 30-40 minutes, stirring now and then, until the sauce has thickened but is still nicely moist. Discard the cinnamon stick and bay leaves. 3. For the pasta: bring 4.5 litres water to the boil in a large saucepan with 8 teaspoons salt. Add the pasta and cook until al dente, taking care not to overcook as the pasta will cook a little further in the oven. Drain well, transfer to a large bowl and leave to cool slightly. 4. For the white sauce: melt the butter in a medium-sized non-stick saucepan. Add the flour and cook, stirring, over a medium heat for 1 minute. Gradually beat in the milk, then bring to the boil, stirring. Lower the heat and leave to simmer for 5-7 minutes, stirring occasionally. Season with the nutmeg and some salt and pepper to taste. 5. Preheat the oven to 180C/gas 4. Stir 250ml (about one-fifth) of the white sauce into the warm pasta with the beaten eggs and half the grated cheese. Keep the remaining sauce warm over a low heat, stirring now and then and adding more milk if it begins to get a little thick. 6. Use the melted butter to grease a large, shallow ovenproof dish that measures about 23cm x 33cm x 7cm. Spread one-third of the pasta over the base of the dish and cover with half the meat sauce. Add another third of the pasta, then the rest of the meat sauce, then a final layer of pasta. 7. Spoon over the remaining white sauce. Mix the last of the grated cheese with the breadcrumbs and sprinkle over the top. Bake for 40 minutes, or until bubbling hot and golden brown. This recipe makes 10-12 portions. Vegetarian version: If you’re making a vegetarian version, exchange the meat for two boxes of Quorn mince, but don’t let it stew in the tomato sauce as you would with the meat. Just add it to the tomato sauce at the very end, just before you start the layering process. Be sure to use a vegetarian parmesan if you’re not using the Greek cheese. Gluten-free version: I made my version gluten-free by using gluten-free flour in the white sauce, gluten free Dove’s Farm corn penne and gluten free breadcrumbs. I keep an inexpensive stockpile of gluten-free breadcrumbs by whizzing leftover slices of Sainsbury’s disgusting Free From gluten free white bread in the food processor, letting it dry out on a baking tray, and storing it in a large tupperware container, for future use. This entry was posted in European, Gluten Free, Recipes and tagged cinnamon, cooking, food, greece, greek, layered pasta, london, oregano, pasta, pastitsio, pastitzio, rick stein, snow on February 1, 2013 by Our Little Organic Life. I’m sorry it has to end this way – before its even started really – but I just don’t think this is going to work. I know there was that weekend away at our mutual friends’ country place in Wiltshire where I flirted with you a bit and brought you back to my place in London. I got swept up in your cinnamony, appley, moist, cakey goodness, I guess, but this really can’t be a long term thing. I think it stems from the late ’80’s when Mum brought home that jar of Friendship Muffin starter. They were great at first – big plumpy, fruit-filled muffins. But then, the muffins never ended. Ever. Friendship Muffin starter took over and soon there were large wooden bowls of the stuff, lounging about under teatowels and bubbling away happily in its own sour pong in every warm corner of the house. I can’t remember who eventually moved out first – us or him? I guess I was emotionally scarred by that experience and although I’ll always wonder what you and I could have achieved in our baking partnership, I guess I just can’t commit. Also, I’ve read about you online. Like any modern girl, I Googled you after the first encounter and I found out what you were called. I know all about you now. 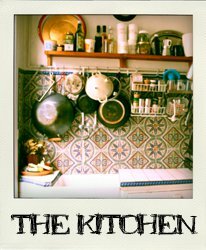 Back in the ’70’s you were really popular and women passed you from kitchen to kitchen, where they fed you and cared for you. But you can’t fool me – nowadays you’re not cool anymore and the only place you’re talked about is in naff places like Mumsnet.com and The Daily Mail. They say that before you’re baked, you smell of old socks and that you take days to get ready. Ten days in fact. I just don’t have the time for you; I have a life to get on with and frankly, I don’t think my friends would like you. You smell. 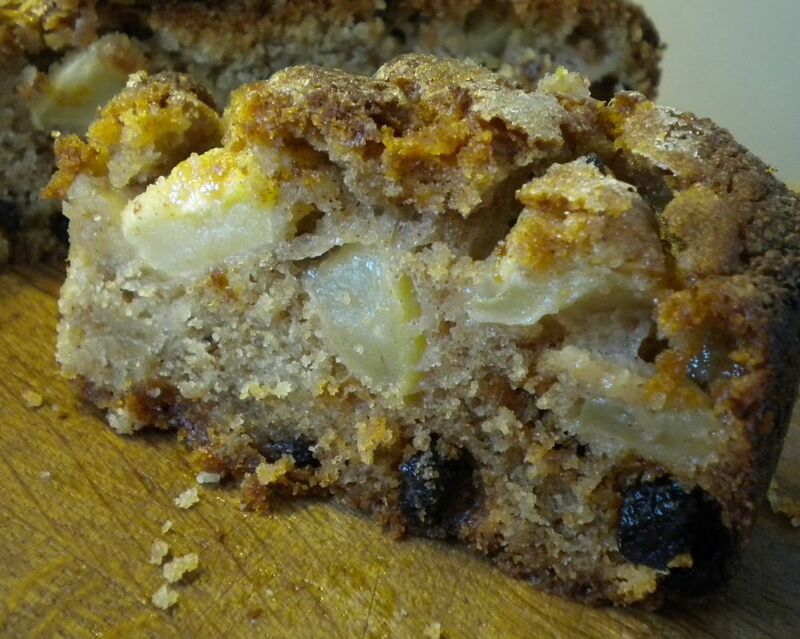 So goodbye, Herman the German Friendship Cake. I hope that you may continue to happily gurgle and bubble across the world for decades to come. Really, I wish you well. Just not in my kitchen. This entry was posted in American & Canadian, Baking & Desserts, British, European, Musings, Uncategorized and tagged cake, commitment, commitment issues, commitment issues with cake...how odd, food, friendship cake, friendship muffins, german cake, herman, herman the german, sourdough on October 26, 2012 by Our Little Organic Life. I have an absolute fascination with Rachel Khoo and her Little Paris Kitchen. Six weeks ago, I’d never heard of her. 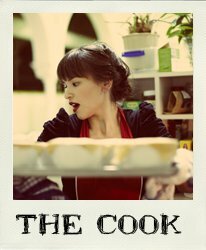 But now, I want to be best friends with Rachel Khoo. I want to get my fringe cut and wear red lipstick and live in a postage stamp apartment. Oh wait…I did do that. Five years ago when I was single. In London. I guess I mean I want to do all those things…but in Paris. *I ripped these photos off her website. They’re not mine. Obviously. But thought I’d say it anyway. 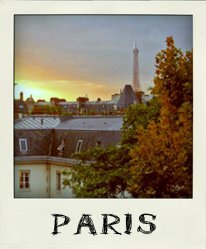 This entry was posted in European, Musings, Travel and tagged food, french food, little paris kitchen, paris, quiche, quiche lorraine, rachel khoo on April 23, 2012 by Our Little Organic Life. Actually, doorbells aren’t one of my favourite things. They give me anxiety because they’re usually being rung by evangelists or delivery boys dropping off delicious takeaways for other flats. And I don’t eat schnitzel. Nor do I particularly like when winter melts into spring – its usually slushy and my boots get wet and muddy. 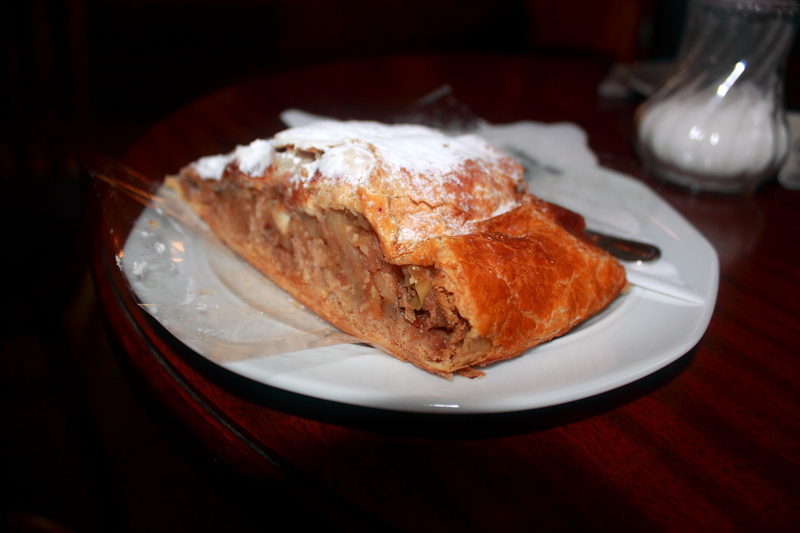 But I do like ponies and I absolutely LOVE crisp apple strudel. Not to mention Mohnstrudel with poppy seeds. And Topfenstrudel which puts any other cheesecake to shame. I remember, years ago in culinary school, my instructor, Chef Jean-Luc, a native of Alsace, who was intensely serious about both his French and German patisserie, taught me to perfectly pull and stretch a small elastic ball of this supple dough out to the size of a tablecloth, big enough to cover a card table. I was really proud of that skill, though I haven’t done it for years now. As we walk through through unsuitable house after unsuitable house, in our attempts to find a new home, I look at the kitchen and I think “could I stretch a strudel dough in here?” Its just as well I don’t say this out loud really because I think our agents are getting a bit fed up with me as it is. On a recent trip to Tirol, I recently indulged my fondness for this semi sweet-savoury pastry accompanied by a short dark coffee with thick crema. And now I long for a house where I can stretch a strudel. And that’s not even a euphamism. This entry was posted in Baking & Desserts, European, Musings, Recipes, Travel and tagged apple, apple strudel, austria, desserts, food, innsbruck, mohnstrudel, poppy seed, strudel, tirol, topfen, topfenstrudel on January 30, 2012 by Our Little Organic Life.